As you know, I don't really like to bake. But there is a certain kind of cake that I like that doesn't tend to be readily available, e.g., this olive oil cake from Food 52, and I'm even more attracted to a cake that can be made with two bowls and a whisk. And because I'm me and don't have a nine-inch cake pan, I baked it in my twelve-inch skillet. And also because I'm me and only buy one or two bottles of liquor at a time and have been working off this bottle of malort for the better part of a year, I omitted the orange zest and substituted the orange juice and grand marinier in the original recipe with grapefruit juice and malort. 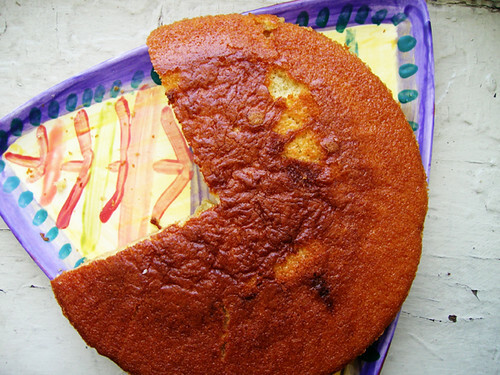 The baked cake doesn't taste much like grapefruit or malort, it mainly features a nice pudding-like texture and an herbal tone that might be those things plus the olive oil. Oil a twelve-inch skillet and line the bottom with parchment paper. Whisk the flour, sugar, salt, baking soda, and baking powder in a large bowl. Whisk the olive oil, milk, eggs, grapefuit juice and malort in a medium bowl. Add the wet to the dry ingredients and whisk until combined. Pour the batter into the skillet and bake for an hour, until the top is golden and a toothpick inserted in the center comes out clean. Let the cake cool in the skillet on a burner for thirty minutes. Run a knife around the edge of the skillet, the original instructions say to invert the cake onto a rack and let the cake cool completely for two hours; but, I don't have a cake rack. So I inverted it on the lid of my saute pan and then inverted it again on this platter that Cara made for me, and then cut a piece to eat right away—it's pretty delicious warm, with a cup of milky tea. ETA: I had a second piece with a couple spoonfuls of greek yogurt and a sliced banana, and that was phenomenal. Those three flavors of cake and yogurt and banana, they blended perfectly together. The rest of the cake I wrapped and put in the freezer; that's the thing about cake for me, I don't want to be eating cake all week. I just want one piece every once in a while, so maybe this will work for that.